Ultraviolet filtration is achieved by using an Ultraviolet lamp. Water is sent through a flow chamber or housing. As the water passes by the UV lamp the microbes in the water are exposed to the UV rays. The cells are rendered sterile and can no longer reproduce thereby considered dead and no longer a threat. UV light is capable of killing micro organisms such as bacteria, viruses, molds, algae, yeast, and cysts like cryptosporidium and giardia. 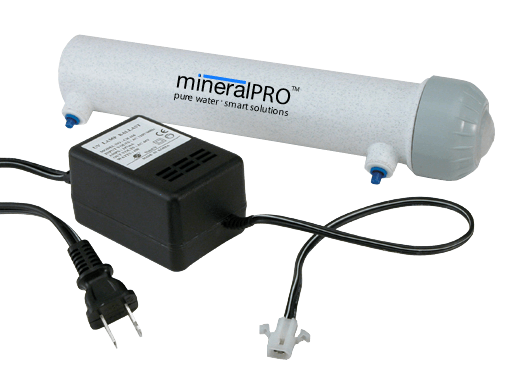 Combining the UV filter with MineralPRO’s Reverse Osmosis or Ultra Filtration Drinking Water System will assure you that your water filtration needs are being met. UV filtration is one of the most cost effective and technology efficient form of filtration available to homeowners to eliminate a wide range of microbiological contaminants from their water supply.